“If you’d like to talk about why I included your game in my video, just send me some pointed questions I can answer for you. I’m happy to have you publish them, if you’re willing to make the full interview available. would be follow-up questions to whatever you respond with. Also understand that our format is publishing stuff as text, not as videos (like you), so what we'd do is publish an article copy-pasting these e-mails. “I used your game as an example of how common such games are on the internet, and an example of the double standards of the people who objected to the “Beat Up Anita” game. You need to understand that I have no moral objection to either game, or any such game. Burning hated figures in effigy and other similar activities are a long and storied human tradition. As such, Bendilin is not immune, but neither is Sarkeesian, who has managed to antagonize a large number of people, whether she intended to do so or not. There was a massive public and media outcry over the game targeting Sarkeesian, but little regarding the one targeting Spurr. Bendilin went so far as to tell me that his primary concern was not the game targeting him, or even the dog-piling he was subjected to on Twitter, but the fact that there were people targeting some of his family members by phone/email, and the fact that his internet infamy may have made him unemployable. There’s a distinct difference between this happening to someone like Spurr (who was just a guy with virtually no public profile) and a professional talking head. From Sarkeesian's position as a public figure (and, let’s face it, her position as a woman and a feminist), she has been able to leverage the negative attention she’s received to her social, political and financial benefit, while Spurr is simply not in a position to do so. No one’s paying him $5000-$20,000 to speak at any event. Last I talked to him, he was selling collectibles he’s had since childhood on eBay to pay his bills. I’m also deeply disturbed that almost no mainstream media outlets reporting on the “Beat Up Anita” game included any reference to Spurr's 6 page preamble, which explained his reasons for creating the game. That preamble, while poorly expressed from my standpoint as a professional writer, was entirely valid and addressed the exact same double standards inherent in the different reactions to his game and your game. 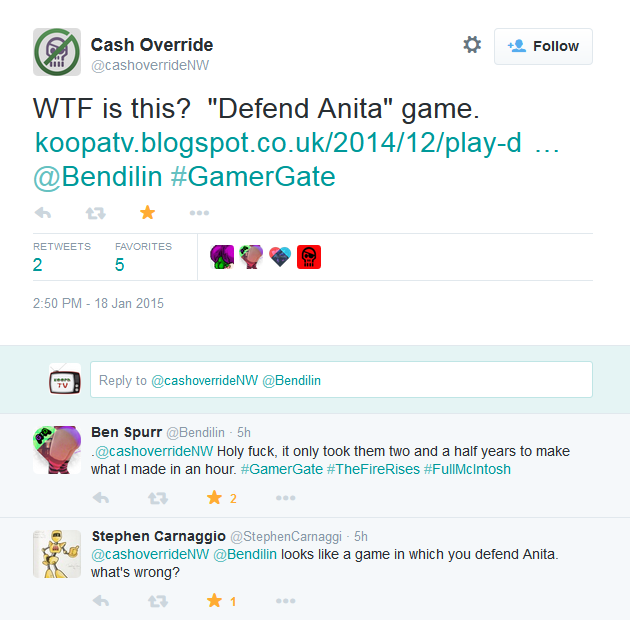 This is how Bendilin discovered Defend Anita Sarkeesian. Just for the record: We obviously didn't start development of it right after he released Beat Up Anita Sarkeesian. “Well, the reason there may not have been a large public outcry about Defend Anita Sarkeesian is because we're pretty bad at marketing ourselves. We targeted two groups of people when advertising the game: Social justice warriors, and GamerGaters. SJWs didn't even bother to acknowledge our repeated attempts to get their attention or their feedback. Probably because they don't actually play games. 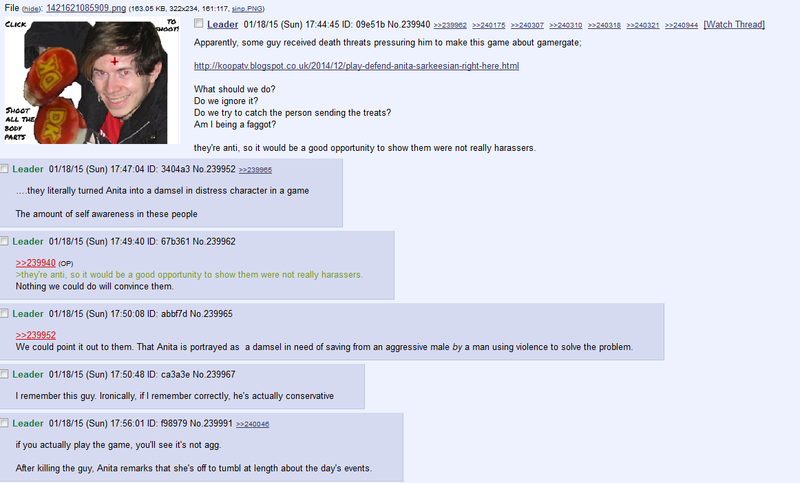 We got a thread on 8chan about Defend Anita Sarkeesian, though. And positive feedback from those who played it. Mostly. We actually got an enormous amount of negative feedback from people who did not play it and merely objected to the title of it, Defend Anita Sarkeesian. They were very confused how anyone could make a game like that, because they really don't like Anita. They actually said that KoopaTV was an outfit of social justice warriors, which we're anything but. We avoided showing Bendilin the game, instead trying to get him to find out about it naturally. We avoided using his name in marketing materials and on our site, so it wouldn't show up if he searched his own name. Eventually, someone showed him it. He... was amused by it. Which is not the response we expected, but the response we preferred. We got absolutely no negative comments about having Bendilin be someone to shoot. We only got negative comments about having a game where Anita is a protagonist. We were worried upon release of the game that we'd be doxxed by someone. That said, and this is to our collective surprise, Bendilin somehow actually has gained employment. He still has it. No idea how. The mainstream media is totally corrupt and an absolute joke, so no surprise there. Yes, our game is still available. It got removed from its content host for being inappropriate, but we reuploaded it after...censoring it slightly (got rid of voice-acted swears), and had a sort of content warning. We very purposefully designed the game to basically be a better Beat Up Anita Sarkeesian from a gameplay perspective, and played Beat Up Anita Sarkeesian for inspiration. So while you can click anywhere on the screen for Beat Up Anita Sarkeesian to damage her, you need to click specific places for Defend Anita Sarkeesian. And there's dialogue and different endings and stuff too. We kept the EarthBound music from the first game as well. KoopaTV wrote about the people who called us social justice warriors here. Maybe I should've linked to it to Karen. Here's the first few comments in that 8chan thread. The last two comments in this screenshot know what they're talking about. The first three after the initial post are all morons. If your intention was to point out double standards/commonality, how come you didn't, uh, have any narration as part of it? You stuck it at the end, like, two minutes after you finished talking, while you had some Ted Talker talking anthropologist gibberish. I guess I'm just not sophisticated enough to figure out what the point of the video was after you finished your narration, and how Defend Anita Sarkeesian fit into that. From what I'm trying to understand of the Ted Talker, it didn't have to do with double standards, and just showing the KoopaTV page with the embed/screenshots of Defend Anita Sarkeesian wouldn't convey to viewers that "there is a double standard here." Am I being too anti-intellectual regarding the Ted Talks? Eh, that's fine with me. You can tell that, as a content creator, I'm mainly concerned with audience perception. I know by now what point Karen was trying to make with Defend Anita Sarkeesian's inclusion, but I don't know how she thinks she was presenting that point to the audience. “I stuck it there for a reason. If you consider what Whitney Phillips was saying about trolls and the transgression of social norms, placing your game there was a demonstration of how your game did not transgress social norms. As you said, no one in media wrote about your game, there was no outrage on social media about it. The ways it was different from the “Beat Up Anita” game were not substantive to the point—the theme of the game was to inflict injury on a hated person. One got massive negative coverage in the media and was censured and disapproved of by every “right thinking” person. The other? Your game? Not a peep. Even though Spurr had WAY less status, power or ability to defend himself or protect himself from damage than Anita. Even though she had WAY more power than he did. Your game transgressed no boundaries or social norms. It evoked no commentary. That’s why I juxtaposed it against Phillips’s commentary on trolls. Spurr was seen as a troll, because he transgressed social boundaries with his game. You were not, because you transgressed no boundaries with yours. The only meaningful difference between him and you is the target you chose. Well, if you only see this picture, you might come to the conclusion the target is the meaningful difference in the games. “I understand what you're saying now, but I still don't think just the placement of Defend Anita Sarkeesian was self-demonstrating any particular point. Actually, the theme of Defend Anita Sarkeesian was promoting gun ownership among women, but you'd have to play the game to figure that out. It's like a plot twist, but with themes instead of plot. I clearly think Karen has not played Defend Anita Sarkeesian. Everything she's said has lead up to that conclusion. you get to this beautiful song that melodically communicates the meaningful difference. “I linked the full TEDx talk in the low bar of the video. It’s well worth the watch, actually, and perhaps viewing it in its entirety might help you understand the point I was trying to make. You were making a point about gun ownership among women. Spurr was making a point about double standards regarding the acceptance of violence/hostility against men and women in video games (and elsewhere)—a point that was rather apt considering how his game was received versus how yours was received. You may see a meaningful difference between his game and yours, and that’s your prerogative, but as is the case with the point of your game, you’d have to play Spurr’s game and read his preamble to get his point about double standards, something few who condemned it felt any inclination to do before passing judgment. I would agree that most TEDx talks are ridiculous, and that much of anthropology and sociology is bunkum, but Whitney Phillips' talk was extremely interesting in the context of Spurr’s situation. Her entire talk was about what trolls can tell us about society’s values when we examine who exactly we immediately characterize as a troll (Spurr, Greg Elliott, Gamergate), and who we do not (you guys, Guthrie and her followers, SJWs or even Sarkeesian). I chose the clips of her talk, and the accompanying footage and images to reflect this. Anita has been lauded and defended by many of the most powerful in the game development and games media industries as well as mainstream media and the political establishment, despite her thesis being nearly identical to that of Jack Thompson, who was vilified and/or ridiculed across the board. Thompson was considered a troll. Anita, for some strange reason, is not. Spurr was considered a hateful troll for his game (even though he was targeting someone much more powerful than he was, which is typically considered fair game), you were not considered trolls for yours (even though you targeted someone who was at the time both powerless and beleaguered by waves of hostility from thousands of people). Gamergate are considered hateful bullies for their targeting of Anita and other SJWs, despite Anita and SJWs enjoying a privileged position in mainstream media. Guthrie, a political activist with a large public platform, was portrayed as a hero for gathering a mob and “standing up to” (read: bullying and harassing) a schmuck with 6 Twitter followers. Gamergate are trolls despite "punching up", Guthrie and her SJW mob are not, despite “punching down". As some social justice types said in regard to Gamergate, there are no bad tactics, only bad targets. It is the target, and not the tactics or actions, that determine who is a troll and who is not. The key to why it all fell out the way it did is in the “anthropological gibberish” of the Whitney Phillips talk. One man’s terrorist is another man’s freedom fighter, right? All depends on how you perceive the causes, motivations or even personhood of assailant and the target. As for this conversation, I’m not sure what purpose it serves. I chose to highlight your game as I did to make a point. That you missed the point, or do not feel the point was made strongly or clearly enough, is again, your prerogative. I hope my responses have helped explain my reasoning. You are free to agree or disagree. You really haven’t had any questions for me beyond the first one. I’ve tried to infer from your responses exactly what you want to know, but if you would like to know anything more, some actual questions would be nice. That's the TED talk. It's a TEDx talk, actually. Which explains why Karen's original video has more views than the TEDx talk she believes to be so brilliant. ...It's 13:37 long, though, so a point for that. I still haven't watched it, even now! Here is my reply, sent July 17. Hey, it was a busy weekend. We studied Bendilin's game closely. There's a design decision difference between Bendilin's Beat Up Anita Sarkeesian and our Defend Anita Sarkeesian: Bendilin's message is front-loaded (you have to read it before playing), while ours is back-loaded (you have to play it first to know what it is). I dunno what you know about actual game design (or you just talk about GamerGate/Anita Sarkeesian as an overall cultural thing), but the way we did it means our message is the last thing people come away with, while the last thing players of Beat Up Anita Sarkeesian come away with is the visceral satisfaction of seeing a bloodied up Anita. Also, KoopaTV is absolutely characterised as trolls. (They wouldn't be that far off.) Not for Defend Anita Sarkeesian specifically, but all the other stuff taken in totality, yeah. Just like how Bendilin already had a reputation on the Internet before he made Beat Up Sarkeesian. It's not accurate to say their theses are the same, however. Jack Thompson focused on how game mechanisms somehow encouraged violence and corrupted youth. Anita Sarkeesian focuses on game stories and characters. ...And sometimes animation for some reason which is stupid. She (though others do say this) doesn't say that games make people sexist, but works in coordination with other media to perpetuate existing attitudes. (And then she makes absurd claims about all sorts of things about what attitudes are right and wrong.) And that most game developers are bad writers, which is true. Those are...different. The prescriptions are the same (ordering people around with newfound power), but the way of getting there is different. Most of the hits that Defend Anita Sarkeesian receives via organic searches are people searching about Beat Up Anita Sarkeesian. Why would they be searching for that? Most likely out of dislike for her. Yeah, liberals are very "the ends justifies the means"-y. Please understand that we're definitely, definitely not on the side of Anita, SJWs, or feminists. We "punch up" all the time to many groups and movements that obtain power by playing the victim card. And we absolutely get hate for that. So we understand where you're coming from. Karen has not replied since, and we've waited exactly a whole month now! She presumably took “We're good now.” to mean the interview is over, or that her ending a response with “Regards” meant she was done. That's fine, though. You can see that I dumped knowledge that only people who really know the game industry from within the game industry (rather than just use it as an example piece in the periphery when your greater focus is within the anti-feminism lens) would know. I'm not sure if she appreciated it. And, hey, might as well dump that Hillary Clinton article because everyone should read it before they vote this November. I didn't differentiate between Jack Thompson and Anita Sarkeesian to do either of them a favour, but it's just getting the facts right. That's what's important. I'm not adversarial with Karen Straughan. We're on the same side... generally. Though I do think she's co-opting movements in terms of the gaming industry. Much like how feminists like Anita are doing that on the other side. 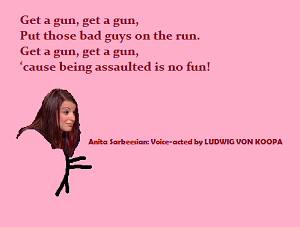 In the end, I'm still overall proud of how Defend Anita Sarkeesian came out. People just got to give it a chance, since there is more to it than a surface analysis. Was Ludwig and KoopaTV part of the dishonest, biased media? Or did the dot-organisation conduct a fair interview? Sound off in the comments section! Also, if you have any feedback on Defend Anita Sarkeesian or Beat Up Anita Sarkeesian, give that as well. Despite the pride, Defend Anita Sarkeesian didn't even win KoopaTV's Best PC Game of 2015 award.